Can you believe this water? It is so crystal clear! I had to stop and take a picture because it is just incredible how pure and clean the water is up on the Salmon River. The Old Salmon River Trail is my old stomping grounds, and having been there 100's of times, I am still amazed every time by the beauty. There is always something that stops me in my tracks and makes it impossible not to get my camera out! Beautiful! We have a few places where the water is clear and I love seeing down to the bottom. I love this trail! Nice photo. Stunning river river. 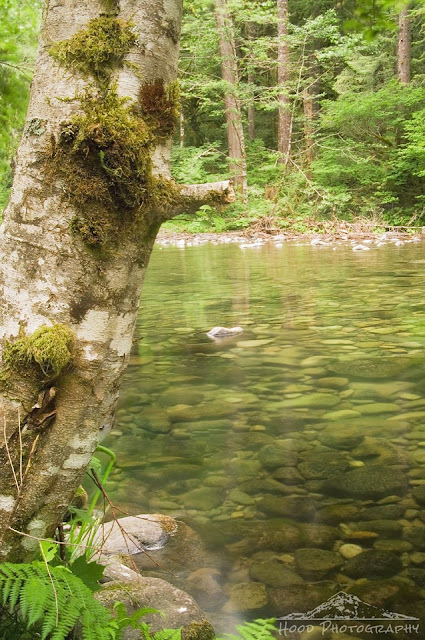 Love the mossy tree trunk and the stones visible beneath the water surface. That water is clearer than water! Gorgeous shot!